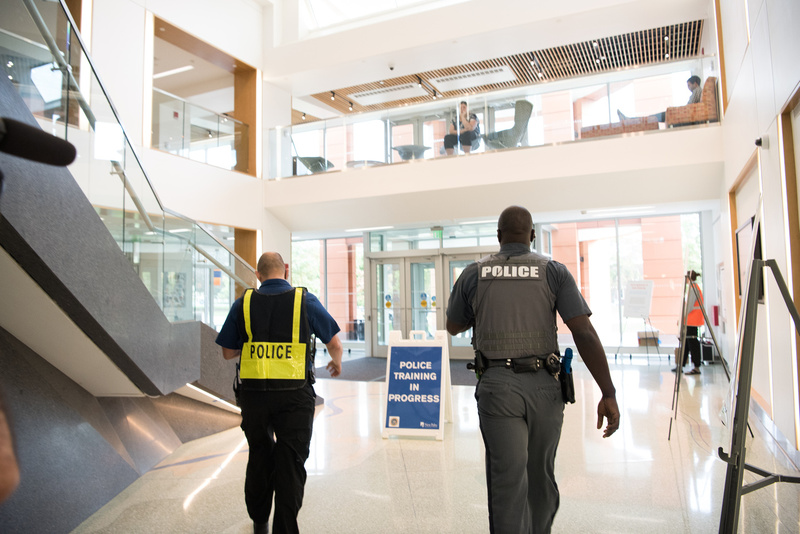 The SUNY New Paltz University Police Department (UPD) and Office of Emergency Management collaborated to plan and execute a successful active shooter lockdown drill in Wooster Hall on Oct. 11. 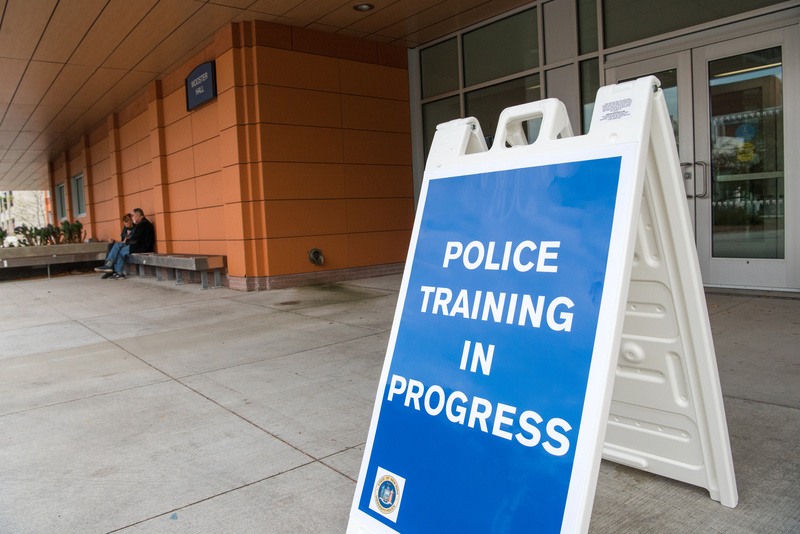 The drill simulated an event involving a threat of violence over the phone, which led UPD officers to identify an armed intruder in the building. 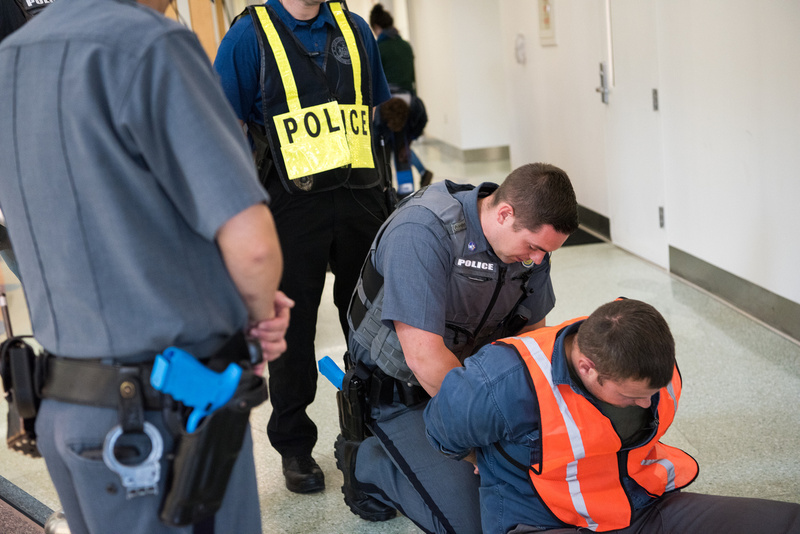 This simulation was designed not only to allow officers to practice their response to such an event, but also for evaluators to learn about how well New Paltz students, faculty and staff understand instructions for reacting to active shooter situations. “We were testing our current Emergency Response Plan procedures, as well as our capabilities to effectively respond to an active shooter, broadcast appropriate public information and warning, physically lock down a building, and gather and disseminate necessary law enforcement information,” said Scott Schulte, associate director for Environmental Health & Safety. UPD and other New Paltz staff have consistently worked to ensure that campus community members understand the best course of action to take in dangerous circumstances. In 2013, the department produced a video, “Crisis on Campus: Shots Fired,” guiding viewers through the “Run, Hide, Fight” sequence of recommended actions to take. The early outcomes of the lockdown drill are positive, but UPD and the Office of Emergency Management will continue to collect and review the notes, survey data, photos and video collected during the simulation, and use this information to further refine the College’s emergency response procedures. The planning and execution of the lockdown drill was led by Schulte and be UPD Chief David Dugatkin and Deputy Chief Mary Ritayik, with support from numerous offices and volunteers across campus, including students, faculty and staff from the Institute for Disaster Mental Health, Disability Resource Center, Psychological Counseling Center and Office of Veteran and Military Services. Visit the College online to learn more about Environmental Health & Safety.